World AIDS Day is commemorated on 1 December. 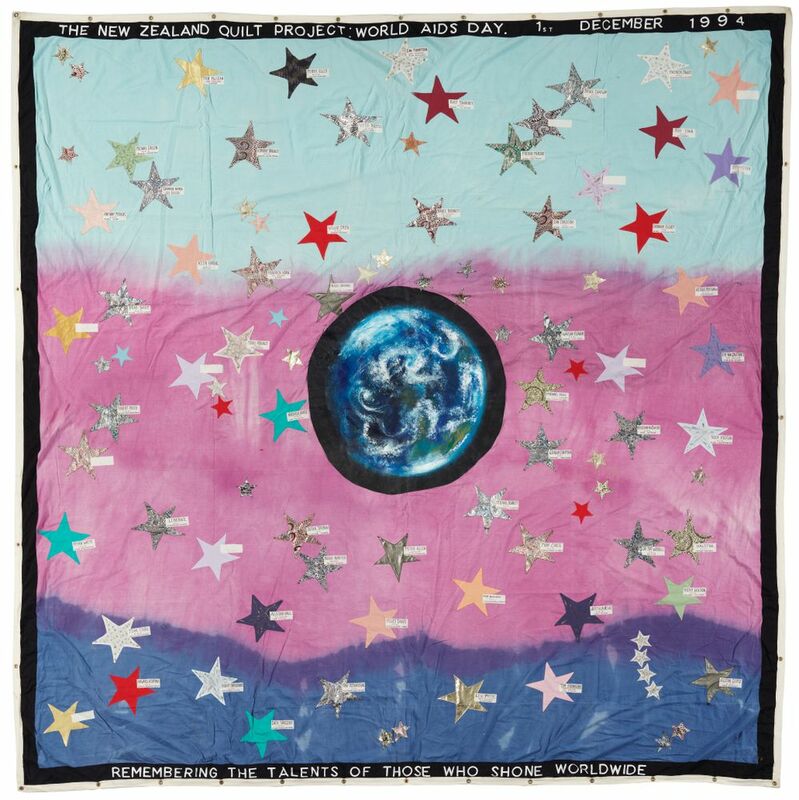 This year, history curator Stephanie Gibson pays tribute to the first unveiling of the New Zealand AIDS Memorial Quilt 30 years ago on 1 December 1988 when HIV/AIDS was devastating communities throughout the world. 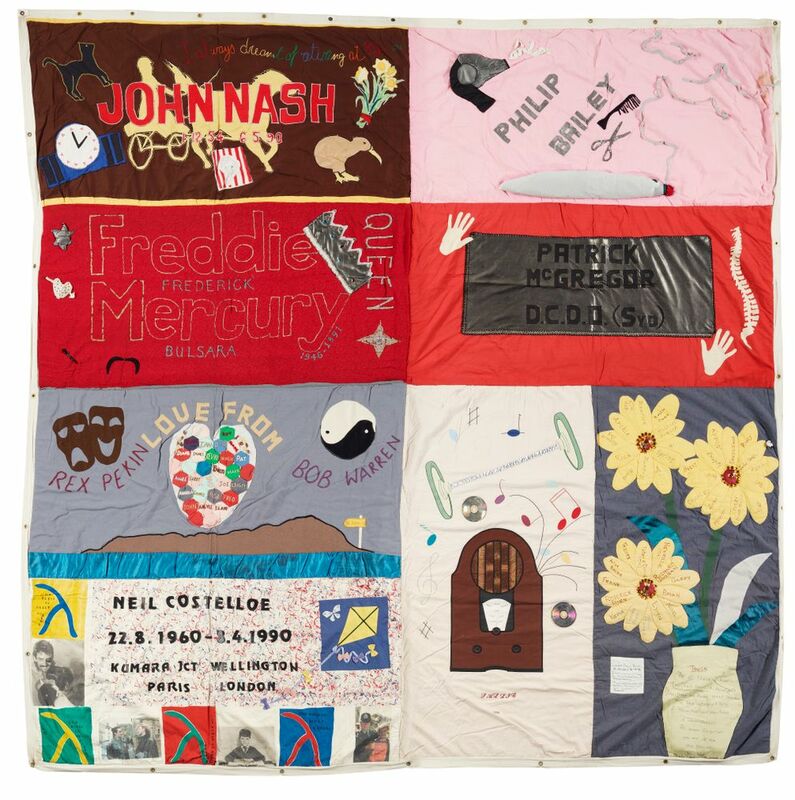 The first AIDS Quilt was made in the United States in 1987 when activists realised the power of publicly naming those who had died of AIDS through the much-loved tradition of quilt-making. Through quilts, they were able to make non-threatening but hugely powerful calls to people for compassion, understanding, and action. Known as the NAMES Project, it inspired many similar projects worldwide, including New Zealand. The New Zealand Quilt Project began in 1988, with the first panel dedicated to Peter Cuthbert (second down on the left). 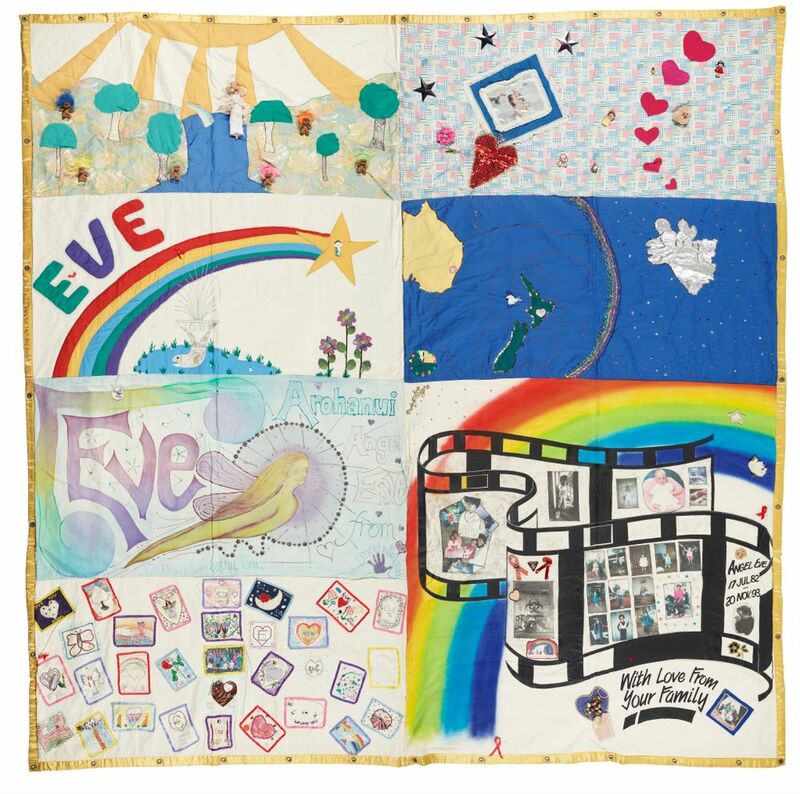 The New Zealand AIDS Memorial Quilt is made up of 16 blocks, each measuring about 4 x 4 metres. Most of the blocks are made up from eight panels. The panels are the dimensions of a standard grave. Most of the panels memorialise people who died of AIDS, and were made by family members, partners, friends, and strangers who simply cared. The intention of the project was to raise awareness and bring the HIV/AIDS crisis to public attention, while enabling loved ones to express feelings of love, loss and regret in a permanent and tangible way. Stitching a panel was a form of social activism, and resistance against forgetting. Apart from dimensions, there were no rules about the quilts. All sorts of imagery and media were used, and sometimes intimately personal references, including complete items of clothing, mementoes, photographs, poems, and soft toys. Most of the panels memorialise the lives of non-famous New Zealanders, but some commemorate the lives of celebrities such as Freddie Mercury and Rock Hudson. This painted block is dedicated to well-known people around the world who died from AIDS. Some panels are dedicated to children who died of AIDS, with a whole block devoted to Eve Van Grafhorst (1982-1993). At three years of age Eve was diagnosed with HIV. She had received contaminated blood from a transfusion given to her as a premature baby. Discriminatory attitudes towards people with HIV/AIDS saw Eve banned from her pre-school in Australia, leading her family to settle in New Zealand, where Eve and her mother Gloria Taylor worked tirelessly to break down ignorance around the illness. Eve died in 1993 at the age of 11. Behind every name stitched into the quilt is a rich story to tell. I am particularly drawn to Neil Costelloe’s panel (bottom left) as it features some of his graphic design work also held by Te Papa. Costelloe (1960-1990) was an activist during the Homosexual Law Reform campaign in 1985-86, providing graphic designs for the Gay Task Force. He died a few years later in London from AIDS-related causes. 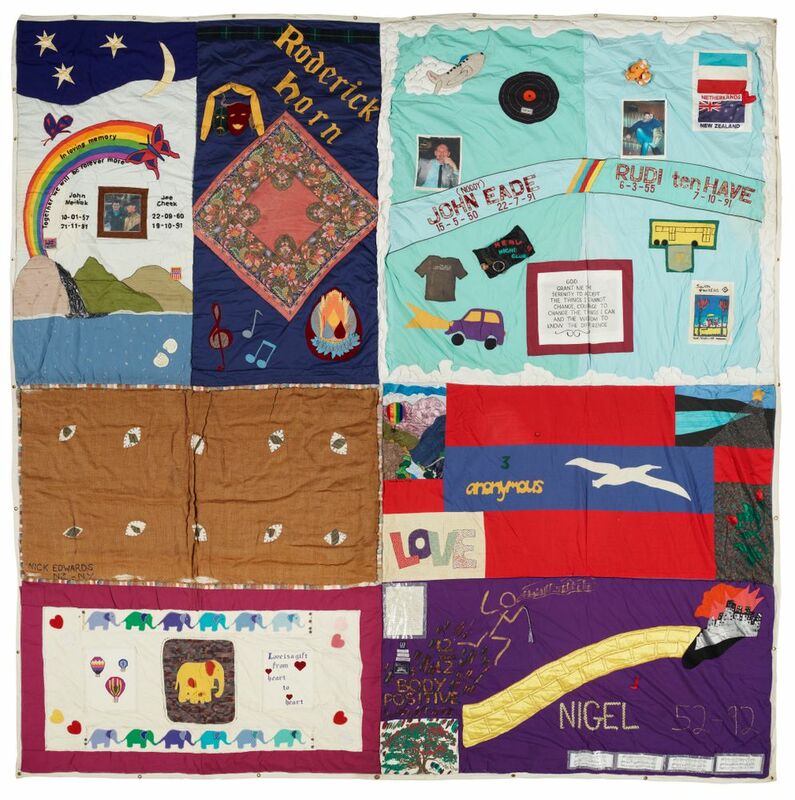 The organisers of the New Zealand AIDS Memorial Quilt skilfully used it to educate people, visiting cities and small towns from one end of the country to the other, displaying the quilt in churches, marae, community halls, shopping malls, schools, museums, and sometimes even outside on grass. At each venue, the blocks were ritually unfolded as the names of the deceased were read out. By 1996, the quilt had been viewed by over 800,000 people. With the introduction of antiretroviral treatment for HIV in New Zealand in 1997, deaths due to AIDS began to decrease. Less panels were crafted. 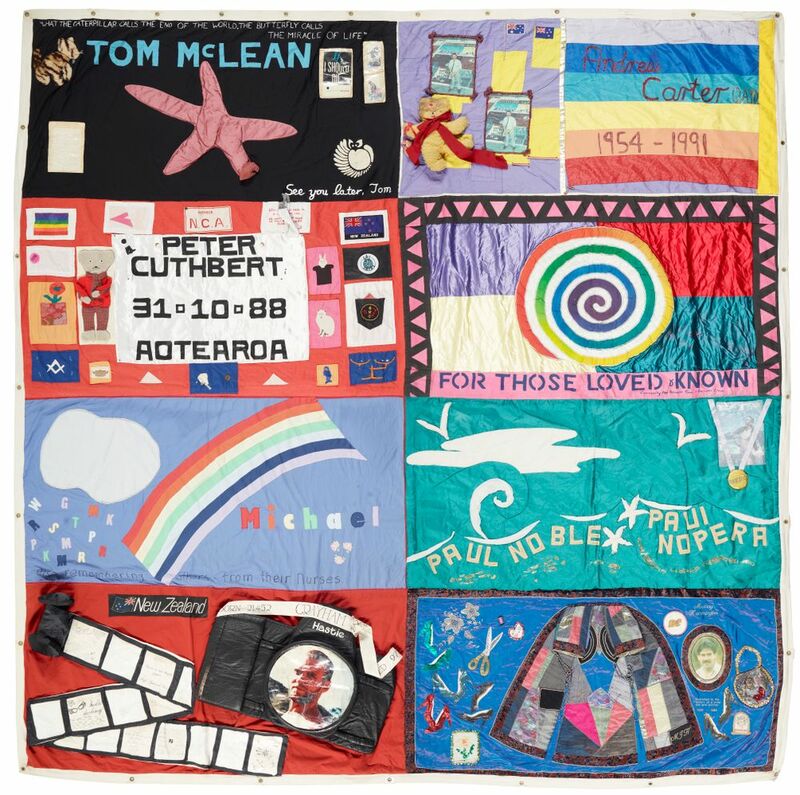 The 16 large blocks of the New Zealand AIDS Memorial Quilt were gifted to Te Papa in 2011 to preserve its power for future generations as a memorial of national significance, as a testimony to the power of civil agency, and a materialisation of the aroha that gathered around needle and thread to grieve, remember, and stand up for human rights. Their presence is also a reminder of the need for continued awareness and education. Treatment can now reduce transmission, but there is still no cure for HIV/AIDS. Thanks for this Stephanie. My partner and I and my pre-teen daughter attended the annual Beacons of Hope memorial services throughout the 80s and beyond, remarkable and deeply moving public ceremonies involving fire, the calling of names and sounding of bells. Personally I saw this as a stronger family commitment than Xmas or any other calendar event. My partner and I both worked in sexual and reproductive health fields at the time, and I volunteered as a support person for people living with HIV & AIDS.